I have the day off so I thought I'd clean the house and write a post for my most recent project. 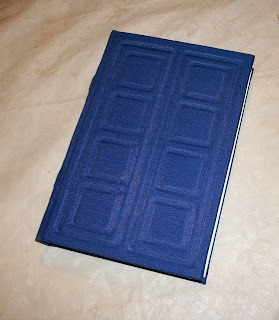 I'm very happy to say that my daughter has become a big Doctor Who fan. I personally have been a big fan of the show since I was very young, maybe 6yrs. old or so. 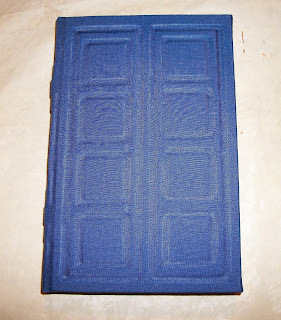 Some day I will have to show you my home-made knitted Doctor Who scarf that I made for myself in Junior High! 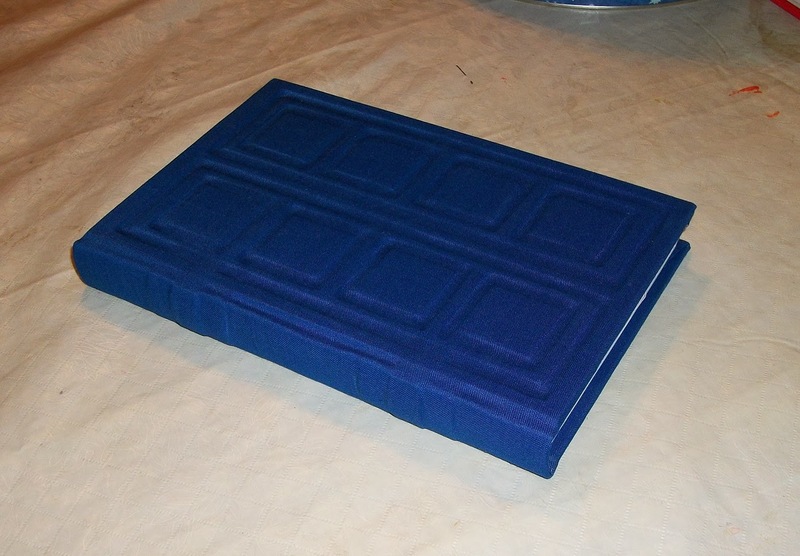 While flipping through the ThinkGeek.com website, looking at rubber d20 molds, I stumbled across two officially licensed versions of the River Song TARDIS diary. The standard version, and the limited edition deluxe version. Both look very nice, and I was trying to choose which one to buy my daughter for Christmas, but then I started looking at them closely and decided that I thought I could do at least as good of a job, if not better, making one myself. Let's see what you think. I started with a Google image search for some screen grabs of the actual prop. 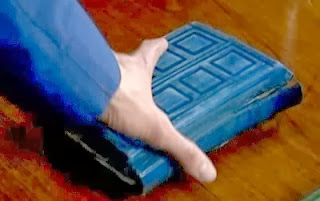 It appears to me is that there are several versions of the prop in various states of age and deterioration, which is to be expected, but more than that, the surface details seem to be slightly different. 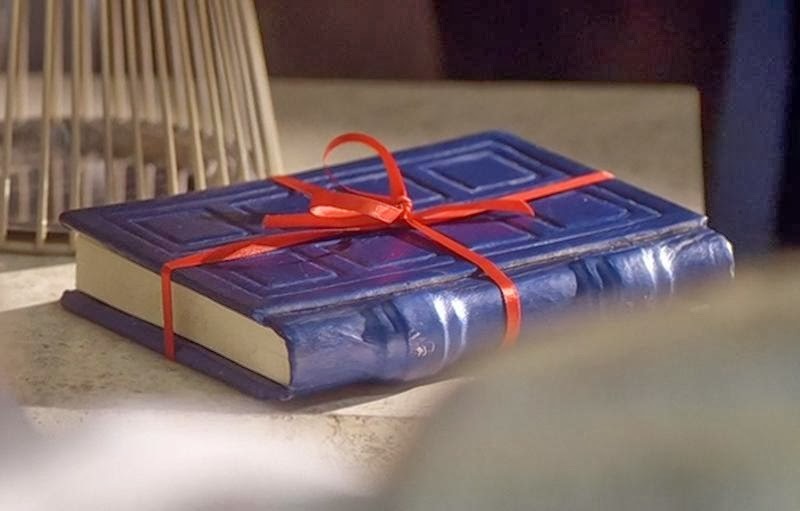 In this image of the book, as it is new, the cover is clearly embossed, or rather in relief. And the covering material appears to my eye to be paper; probably painted kraft paper, judging from the way it wrinkles on the spine reliefs. 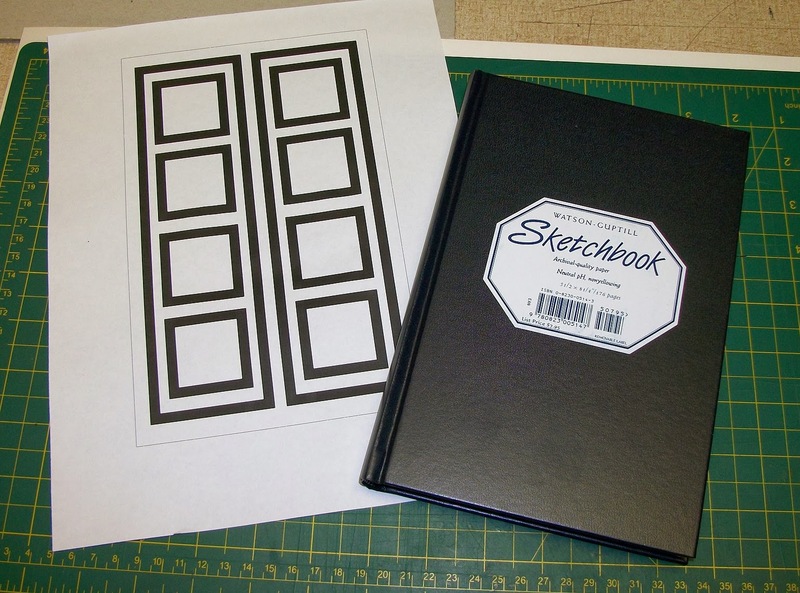 But in these pictures, at first glance the cover details look the same, but under close inspection, the rectangles and squares look, to my eye, to be painted on. The spine relief is much less pronounced. 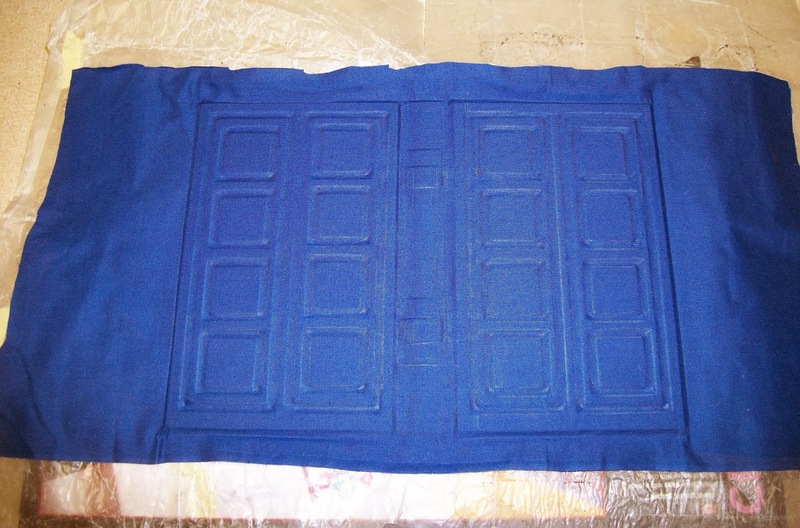 The cover material looks to be cloth. The top and bottom horizontal lines of the outer rectangles extend past the vertical lines, which they clearly do not on the "new" version above. The Standard version from ThinkGeek also looks to be painted on (with the extended lines), while the deluxe edition is in relief, without extended lines (but it's in faux leather, and the color looks off). So first step was to decide on which screen grab version to use as my model. 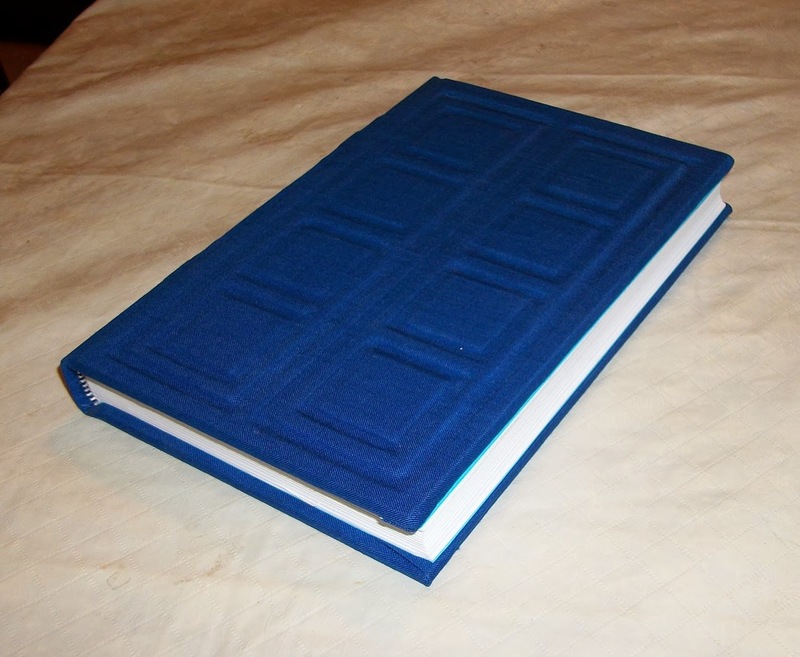 Since painted on surface details were just not going to do it for me, I opted for the "newer" version, with a relief surface, non-extended lines, but with a cloth cover. A quick look around the shop and I quickly spied a very serviceable blank book to use as the base. 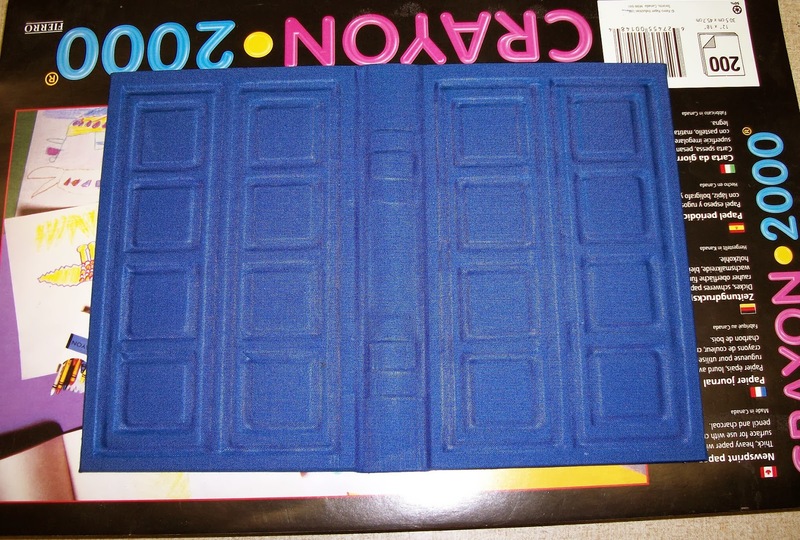 Rather than make the TARDIS door design out of piecemeal strips of chipboard, I decided to cut out the whole pattern from one piece of chipboard. 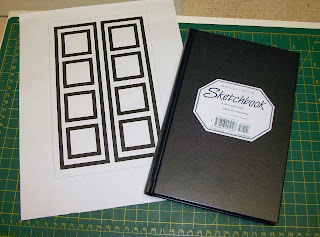 I measured my book and made a full scale mock up of the surface details in CorelDraw and printed it out to use as a cutting guide. I made a little bit of a mess of the French groove while removing the book block. This particular brand of sketch book is bound very tight and has a good mull, but the covering material is very thin and it ripped along the spine while I was cutting through the mull. No problem. Easily fixable. I just turned to my old pall, Tyvek. This stuff is very lightweight, thin and flexible, it glues well, and is super strong. Seriously, I can't even rip this stuff with my bare hands. And it's cheap too! You can recycle mailing envelopes to get a free supply. 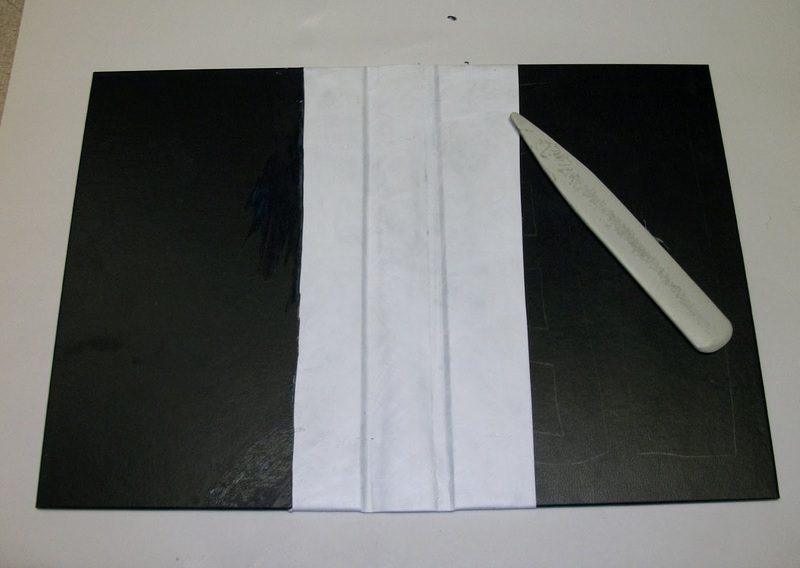 I love Tyvek for strengthening the spine joint of books I make or repair. 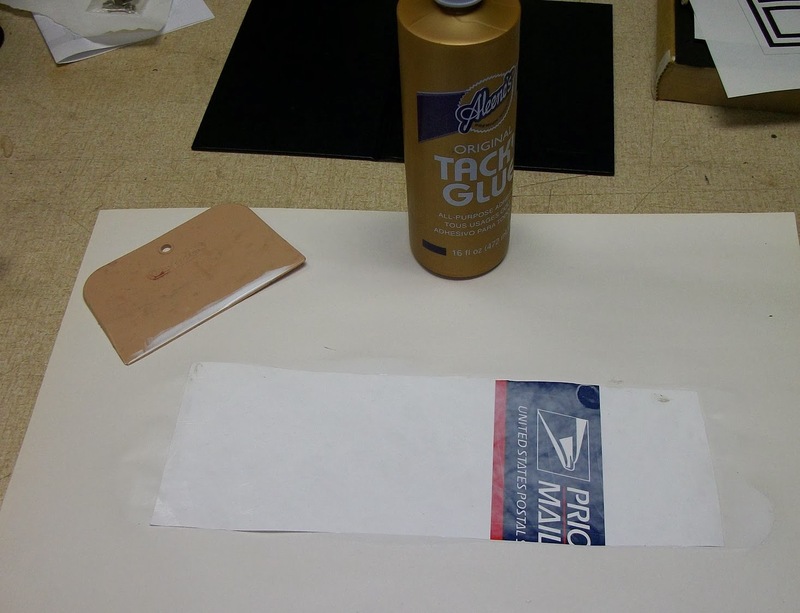 I usually use a brush or a sponge roller to apply the glue, but this time I tried using a car body putty spreader. It works very well. Faster and easier than a brush, and less wasteful and cleaner than a roller. And so with a little smoothing, voilà, the spine is stronger than ever. 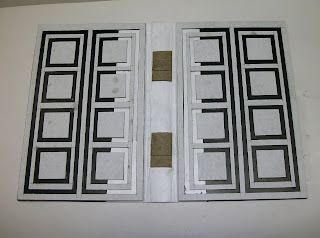 To create the surface relief, I used my standard 0.057in. 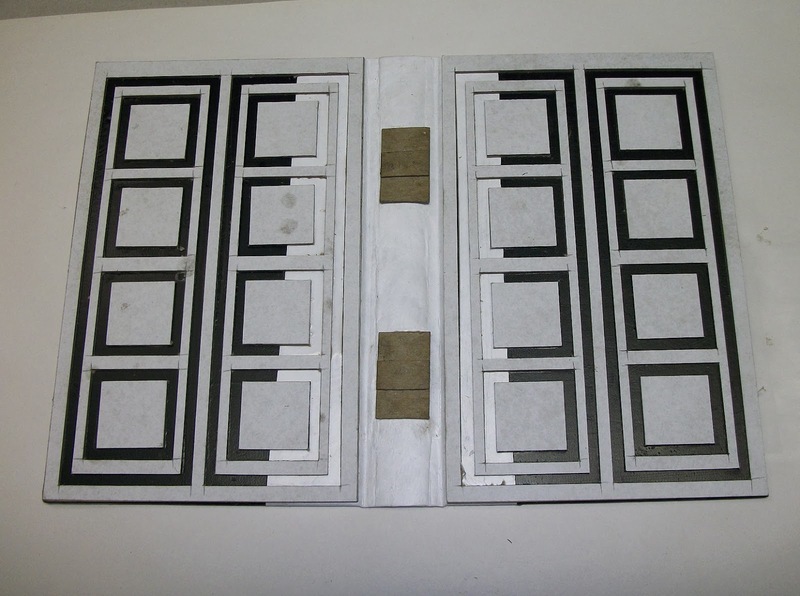 thickness chipboard. I glued the printed cutting guide directly to the chipboard and used a hobby knife and a metal ruler to cut out the blackened outline. This took a while. There are a lot of cuts in that design. Then I spread glue on the cover boards and pasted down the cut chipboard pieces. I just eye-balled the spacing. Front and back, of course, and then some more chipboard for the spine reliefs. 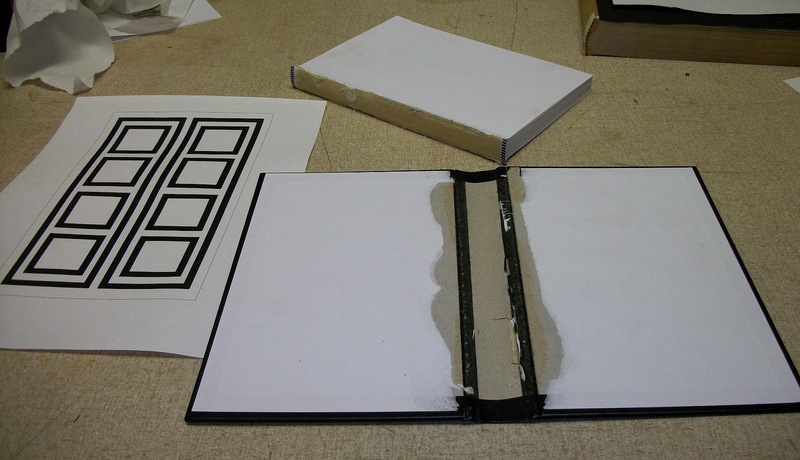 Fearing that the cloth I had selected as the covering material was a little too thin and might reveal some of the underlying framing and color differences, I decided to first cover the boards with kraft paper and glue, working the paper into the crevices with a bone folder. 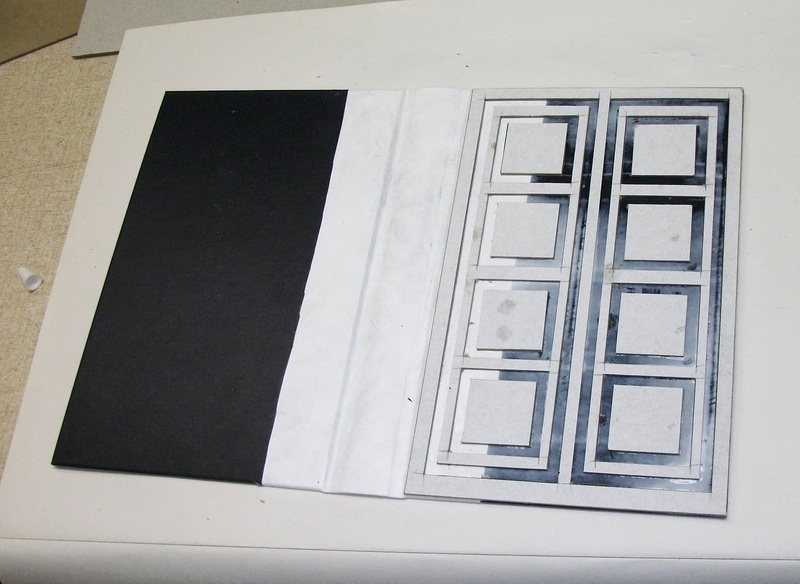 Then I gave it a very light and quick spray of flat black spray paint to make the underlying surface a little darker, which would slightly darken the color of the cloth cover (or so I figured). My blue cotton cloth was light weight and might soak up too much glue as I worked it into the crevices, wetting it out and creating a mottled surface, so I decided to use a strong spray on adhesive, 3M 77, to attach the cloth to the kraft paper. 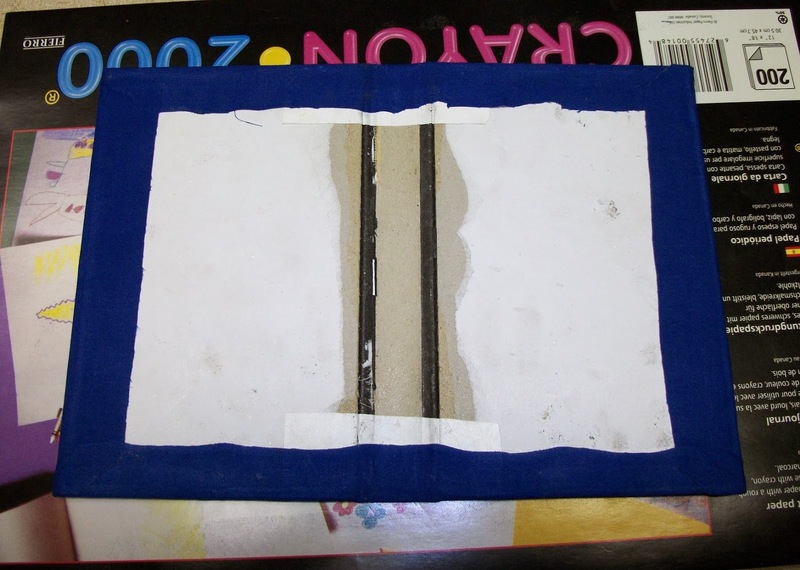 Again, I worked the cloth into the cover's crevices with a bone folder. And there you have the finished cover. 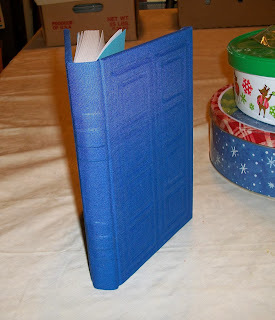 and voilà, a TARDIS book fit for a Time Lord! Sorry if the texture of the cloth made the pictures come out a little weird. They look better at full scale. 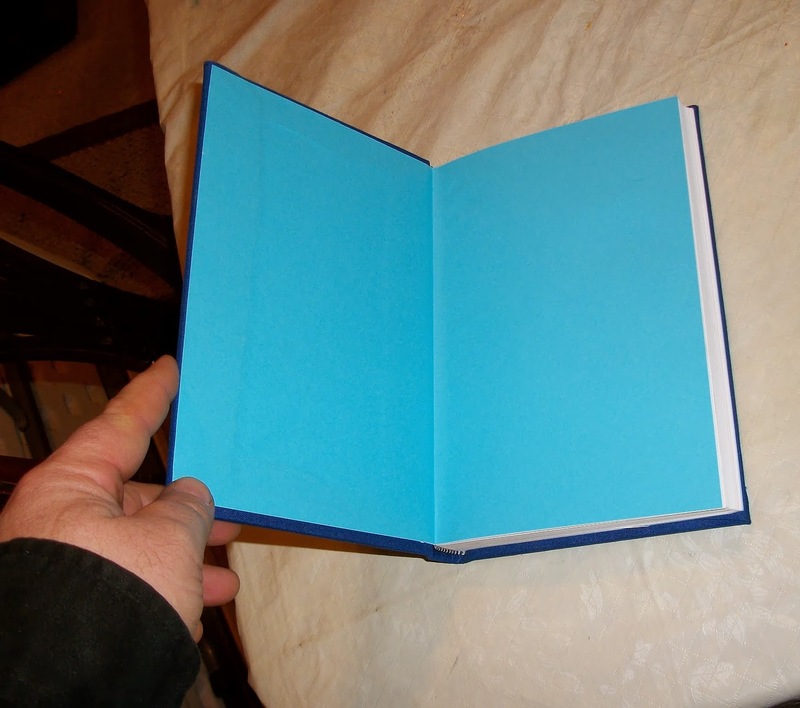 I made this book pretty quickly. It took a few hours, 20 minutes here and there spread out over about five days, because my daughter was also working on a project for a Christmas present and I could only work on this when she wasn't in the workshop with me. I hope you (and she) enjoy it. 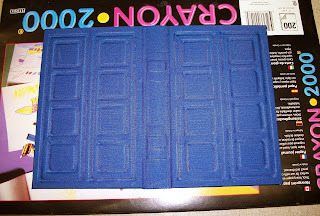 I think it turned out pretty well and, with the exception of the tedious cutting out of the panels, it was pretty easy. I may make a few more and sell them in my shop. 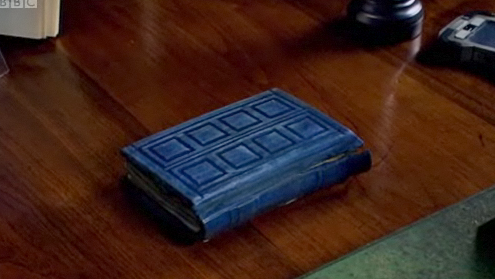 I wonder how many Doctor Who fans are in my area?